Last night Fairfax County DOT staff presented an update on Reston Bikeshare. Participants were given an opportunity to comment on the proposed bikeshare station locations (right). 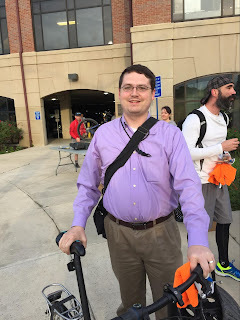 Adam Lind, the new bike coordinator, then gave a short update and answered questions. The county received $500,000 in 2013 to fund a feasibility study and for initial implementation. The county is applying for an additional $500,000 from the Transportation Alternatives Program (TAP) for "Reston Bike Share Capital Equipment" ($400,000 federal funds and $100,000 local matching funds). The Reston system will be part of Capital Bikeshare. See the Washington Post article that appeared in today's paper: Capital Bikeshare is coming to Fairfax. First stop, Reston. Late 2016-Early 2017 - Capital Bikeshare in Reston Begins! An option for expediting the project is to use local funds for some of the initial activities. Adam noted that two of the station locations were modified from the earlier plan. Station 6, Wiehle Station/Southside was eliminated and Station 12 was moved to a better location further west. 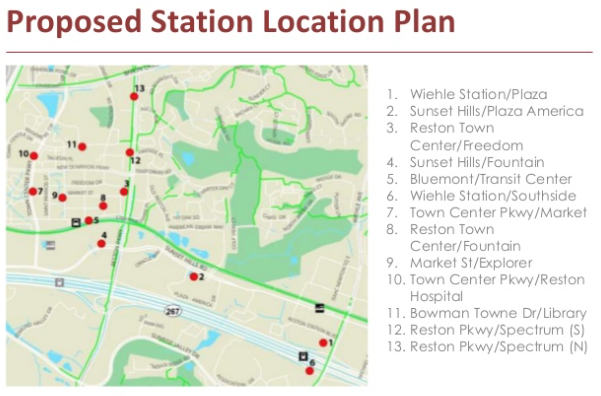 The Reston Hospital station will be located on Town Center Parkway, a long walk from most destinations at the hospital and surrounding medical buildings, highlighting one of the major challenges of locating stations on private property. Even though the system will not be adjacent to other bikeshare stations, operations and maintenance will be conducted by Motivate using their DC facilities. As the system grows it may be necessary to localize those activities. 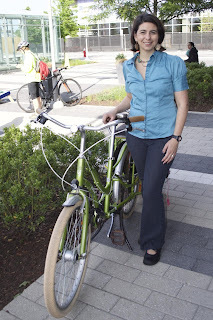 Reston, Va. - Fairfax Advocates for Better Bicycling (FABB) recently released responses to the FABB Candidate Surveys. FABB sent a list of questions regarding bicycling in Fairfax County to candidates for the Board of Supervisors and a separate set to FCPS School Board candidates. A total of 12 of 19 responses were received from the Board of Supervisor candidates and 19 of the 24 from the School Board candidates. All Board of Supervisors candidates who responded agreed with "Do you support safe bicycling as an integral part of the overall transportation options in Fairfax County." These same candidates would also support Fairfax County seeking recognition as a Bicycle Friendly Community from the League of American Bicyclists. Three quarters or 75 % of respondents said they support implementing the Bicycle Master Plan recommendation to "Allocate an annual budget dedicated to bicycle planning and program initiatives." Another recommendation of the Bicycle Master Plan, funding Bike Fairfax in FY17, if funds are available was supported by most. One respondent did not support this recommendation. FABB is encouraged by the overwhelming support by the Board of Supervisor Candidates for improving bicycling in Fairfax County. All School Board candidates who responded to the survey generally agreed with the statement "The school system and school board should be doing more to enable FCPS students to walk and bike to school instead of driving or being driven." When asked whether they would support "hiring of a full-time Safe Routes to School Coordinator" when grant funding for the current position ends in August 2016, the responses were mixed. Two respondents said no. Most others supported the goal of a full-time SRTS position but only under certain conditions given the current budget situation. The majority of respondents "support a comprehensive traffic safety education program that ensures, at the appropriate age levels, all students learn how to safely walk, bike, drive and use transit for their daily travel needs." Two candidates did not support such a program, despite such being current School Board policy. While several respondents supported the concept of conducting a "comprehensive transportation study of FCPS to understand FCPS' student transportation patterns, regional traffic impact, costs and other factors that drive decision making," four did not support such a study and others expressed qualified support. 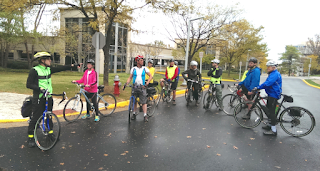 FABB is encouraged with the support for improving bicycling in Fairfax County exhibited by the Board of Supervisor candidates and School Board candidates. FABB does not endorse candidates. In fact, road users’ gas taxes now account for less than half of what’s spent to maintain and expand U.S. road systems, and the resulting shortfall is made up from other sources of tax revenue at state and local levels, generated by drivers and non-drivers alike. According to the study, car ownership for the typical household is now being subsidized by $1,100 per year (over and above the costs of gas taxes, tolls, and other user fees). The huge—and generally hidden—subsidy for car use has an important consequence: too low user fees (gas tax, tolls, etc. ), in effect, pay people to drive more, creating greater demand for the road system. Cortright notes that if roads were priced to recover even the cost of maintenance (and my guess is that the recently claimed planned $17 toll for I-66 will still fall short of this), driving would be noticeably more expensive, and people would have much stronger incentives to drive less, and to use other forms of transportation, such as transit and cycling. 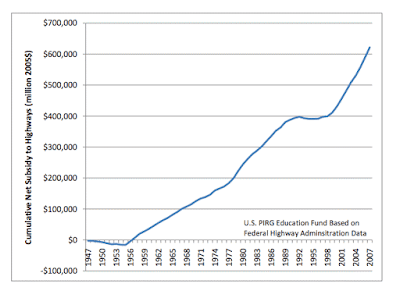 The study has many other important findings and examines the implications of funding shortfalls for traffic congestion, road repair, and new highways. Cortright adds that the problem of pricing roads correctly is one that will grow in importance in the years ahead because improved vehicle fuel efficiency and more electric vehicles will further diminish gas tax revenues and because autonomous self-driving vehicles and the business model of companies like Uber take advantage of paying much less for the use of the road system than it costs to operate. Cortright notes that these same issues can be raised about public-transit, biking, and walking projects but writes that a key difference with these other forms of transportation is that they arguably come with bigger social benefits—lower congestion, less pollution, greater safety, and make transportation available to those who don’t own or can’t operate a motor vehicle. When most people think about going to Tysons they think about navigating Routes 7 and 123 which are congested major state highways. Or they think about the Dulles Toll Road or the Beltway which are limited access highways. What many don't realize is that there are relatively bike-friendly routes into Tysons, and with over 2 miles of new bike lanes inside Tysons, biking to and through the area is improving. FABB sponsored the FABB Social Ride - Tysons New Bike Lanes on Sunday morning to check out the new bike lanes and use two major bike access routes into Tysons. We mostly followed neighborhood streets leading into and out of Tysons. See the Tysons ride cue sheet and the route map on the right. We left from the Vienna Town Green and headed east on the W&OD Trail for a short distance to a trail that leads to Branch Rd in Vienna. We then followed Echols St to Wolftrap Rd all the way to bike lanes (or the paved side path) on Gallows Rd. We turned right on Gallows Branch Rd that turns into Kidwell Dr and the bridge over Route 123, then right on the Tysons Corner Center ring road where there are bike lanes leading to a paved trail that extends to paved shoulders on the Westpark Dr bridge over Route 123. There is a short section on Westpark that will soon have sharrows leading to the new bike lanes on Westpark just past Jones Branch Dr.
We then made a loop, turning right on Westbranch to view the first extensive buffered bike lane in Fairfax County, then continued right on Jones Branch, which will have bike lanes after being repaved next year. There is a climbing lane on the uphill section of Jones Branch past the Hilton leading back to Westpark. We stopped at Park Run Dr to view the new bike lanes and then continued on the Westpark bike lanes to new bike lanes on Greensboro Dr where set stopped for a discussion of the challenges faced implementing the project. The recently adopted Bicycle Master Plan is playing a key role. We were very fortunate to have key staff from VDOT and FCDOT to provide background information. Greg Billing, WABA's new Executive Director also joined the ride. The Greensboro bike lanes continued to Spring Hill Rd where we turned left to head to the Spring Hill Metro station. The signal at Route 7 is definitely not bike-friendly and does not allow enough time for cyclists to get through the intersection before it changes to red. Some of the group crossed in the crosswalk. The intersection is so wide that it took two cycles of the ped light to get across. From there we took the Route 7 side path to Westwood Center Dr past the new urban Walmart complex and made our way to Ashgrove Lane to left on Northern Neck Dr which leads to the Ashgrove Trail, a major entry point to the Tysons area from north Vienna neighborhoods. There are three options from the trail; head west on Montmorency Dr toward Wolf Trap and eventually to the W&OD Trail, head south on Ashgrove Lane to get to Courthouse Rd, or head east toward Westbriar Elementary School and roads that lead to downtown Vienna. After the ride several of us stopped for lunch and beverages at The Caboose, the very popular new brewpub located adjacent to the W&OD Trail. Most of the customers arrived by bike. It was a fitting end to a very successful FABB Social Ride. In mid October FABB sent the 2015 FABB School Board Candidate Survey and cover letter to all Fairfax County School Board candidates. We asked that survey responses be returned to us by Oct. 23. As of today we have received 17 responses to the survey from a total of 24 candidates. Thanks to all candidates who took the time during a very busy campaign period to fill out the survey. The purpose of the survey is to allow candidates to discuss their positions on a number of questions regarding school transportation issues with a special emphasis on biking and walking to school. Because of our nonprofit status we do not endorse candidates. Do you agree with the statement? "The school system and school board should be doing more to enable FCPS students to walk and bike to school instead of driving or being driven." Do you support the hiring of a full-time SRTS Coordinator position to help achieve this goal (current position is grant funded until Aug 2016)? Do you support a comprehensive traffic safety education program that ensures, at the appropriate age levels, all students learn how to safely walk, bike, drive and use transit for their daily travel needs? Currently only drivers education is taught. Note: In 2012, the School Board adopted the following policy: "The school system will ensure that programs of walking, bicycling and bus safety education shall be established and maintained for students in the elementary schools." Do you support a comprehensive transportation study of FCPS, akin to the school lunch and school start time studies, to understand FCPS' student transportation patterns, regional traffic impact, costs and other factors that drive decision making. Fairfax County plans to build a bridge across the Dulles Toll Road/Access Road as an extension of Soapstone Dr. The Soapstone Connector will extend from Sunrise Valley Dr to Sunset Hills Dr. The County is holding a public meeting tonight to provide an update on the project. The meeting will be held from 6-8pm at South Lakes High School, 11400 South Lakes Drive, Reston, VA 20191. A presentation will be given at 7pm. In Reston the Dulles Toll Road is a major barrier to north-south bike travel. 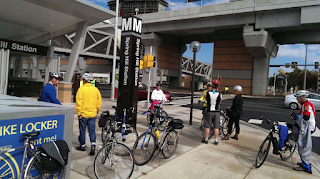 The Soapstone Connector will provide a much needed additional way for northbound cyclists to reach the W&OD Trail, Plaza America, and other locations. Bike lanes are planned on the Connector along with a shared use trail. The new bike lanes will connect to bike lanes on Soapstone Drive to the south. Those lanes extend from Sunrise Valley Drive all the way to Lawyers Road. Many cyclists use this route to connect to the Wiehe-Reston East Metrorail station and destinations to the north. 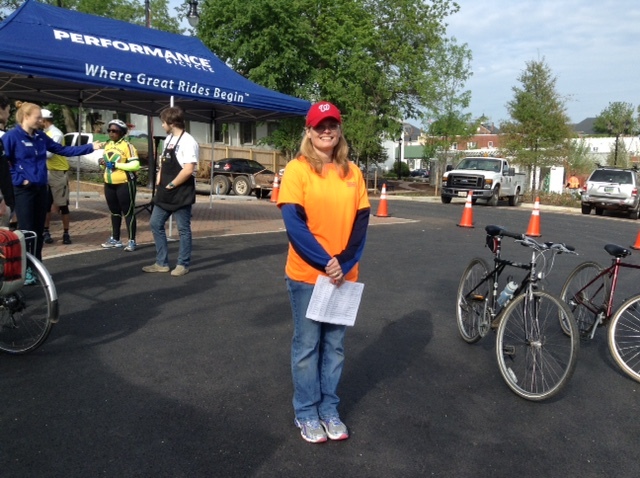 An employee of Fairfax County Public Schools, Debbie Skeins of Fairfax City talked to FABB at the local Bike to Work Day pit stop. Debbie said that, in addition to commuting, she rides to run errands and exercise, regularly participating in group rides with the Potomac Pedalers. She said biking helps her “clear my head” and she loves getting fresh air. Debbie added that it takes her no more time to bike to work than to drive. Debbie also said that when she and her family go biking, they greet and talk to more people and see more interesting things. Since 2005 Fairfax Advocates for Better Bicycling has been promoting bicycle engineering, education, encouragement, enforcement, and evaluation throughout Fairfax County. The Bicycle Master Plan, adopted by the Board of Supervisors in October 2014, contains ambitious recommendations for transforming Fairfax into a more bicycle-friendly community. Unfortunately, Fairfax County has not provided adequate funding to implement the vision outlined in the Bicycle Master Plan. While significant engineering progress was made this year when several miles of bike lanes were implemented as part of the summer paving program, there is no dedicated funding for education, encouragement, and evaluation programs. Better bicycling will attract new businesses, provide for safer routes to schools, reduce traffic, and promote a more active, healthier life style for ages 8 to 80. Beginning in 2016, our bicycle advocates will need the support of local elected officials to make meaningful changes in the county. Allocating scarce resources to implement the Bicycle Master Plan will benefit future generations and result in a safer, healthier, and more competitive communities. So that our supporters and all county voters can be informed about your views and level of support for better bicycling, it would be greatly appreciated if you would complete, sign, date return the attached short survey to Fairfax Advocates for Better Bicycling, P.O. 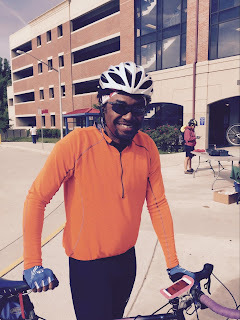 Box 3752, Reston, VA 20195 or chairman@fabb-bikes.org no later than October 20, 2015. We will compile and publish the survey results as a nonpartisan, educational tool before the November election. Please note that our 501(c)(3) status prohibits us from endorsing candidates and contributing to partisan election campaigns. Should you have any questions please contact me at chairman@fabb-bikes.org. A. Do you support implementation of this recommendation? B. If so, how will you support it? 3. Would you sponsor or support a motion for Fairfax County to seek recognition as a Bicycle Friendly Community by the League of American Bicyclists? 4. The Bicycle Master Plan also recommends development of an encouragement and education program call Bike Fairfax with dedicated staff separate from the Bike Program staff. The program could be funded using Transportation Demand Management (TDM) and Federal Congestion Mitigation and Air Quality (CMAQ) sources. Will you support Bike Fairfax funding in the FY 2017 budget? 5. Please comment on your bicycling experiences and your efforts to support better bicycling to places of work, play, study, and worship. Update: We received an additional response that was recently added to the others for a total of 12 of 19 who have responded. Fairfax County announced today the selection of Adam Lind as the new Bicycle Program Manager, commonly referred to as the bike coordinator. Adam has been serving as the acting bike coordinator since the position became vacant with the retirement of Charlie Strunk in January of this year. Congratulations Adam! You can congratulate Adam yourself at tonight's FABB meeting or on the FABB Social Ride to Tysons on Sunday. Adam has done a great job as acting coordinator, working with VDOT on the creation of over 34 miles of new bike lanes as part of this summer's repaving program. The work included conducting numerous meetings around the county to seek comments on individual projects. He is developing a plan to implement bike sharing in Reston. Most recently he has worked with VDOT on the design of the I-66 parallel trail and other bike facilities related to the project. Most recently, Lind has worked on coordinating the implementation of bike lanes throughout the county as part of the Virginia Department of Transportation (VDOT) repaving program and the establishment of a bike trail along the I-66 corridor outside the Capital Beltway (I-495) as part of the Express Lanes project. One of his early tasks in his new position will be to coordinate an implementation plan for priority projects in the Bicycle Master Plan. Prior to joining FCDOT, Lind completed internships with the Town of Chapel Hill, North Carolina; City of Blacksburg, Virginia; and Montgomery County, Virginia. He holds a Master’s Degree in Urban and Regional Planning from Virginia Tech and a Bachelor’s Degree in Business Administration from the University of North Carolina at Chapel Hill. Join us for tonight's FABB's meeting at 7:30 p.m. in Vienna at Patrick Henry Library near the W&OD Trail. We'll be discussing the two I-66 meetings held this week in Fairfax and the next steps for ensuring bike facilities are part of the multimodal project, including the extension of the Custis Trail outside the Beltway. Adam Lind, the county Bike Coordinator, will give an update on other bike-related activities in the county. We'll also discuss the responses from the Board of Supervisor's Candidate Survey. All are welcome. Use the entrance to the far right of the building. Exhibits for the public meetings are available online and show the proposed bicycle and pedestrian facilities in several segment concept plans. See the parallel trail overview plan for both Fairfax and Prince William Counties. Canaan Merchant, a technical and project engineer for the U.S. Government, bikes from his home in Burke to the Virginia Railway Express (VRE) Station to get work but also for running errands and recreation. He told FABB that he rides because it is fun, clean, and healthy, and he loves the sense of freedom it gives him. Canaan is a regular contributor of blog posts to the Greater Greater Washington website, where he writes about transportation and urban design issues. Bikesharing will soon be coming to Reston. See the Reston Bike Share feasibility study for more info. Fairfax County will provide an update on Reston Bike Share on October 29 at 7pm at Dogwood Elementary School, 12300 State Rte 4721, Reston, VA 20191. We hope the system will be integrated with Capital Bikeshare (CaBi). 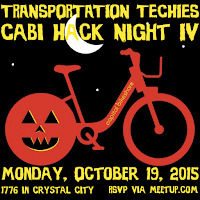 CaBi Hack Night is a show & tell of apps and data visualizations about Capital Bikeshare. Read about CaBiHackNight I and II and III to get an idea of how it works. Doors open at 6:00; presentations start at 6:30. Note we are at 1776's Crystal City location, in Arlington, VA.
Fairfax County DOT are holding a meeting to update the public on the status of bikeshare in Reston on October 29th, at 7:00pm, at Dogwood Elementary school. The county-funded Reston Bikeshare Feasibility Study was completed in June 2014. 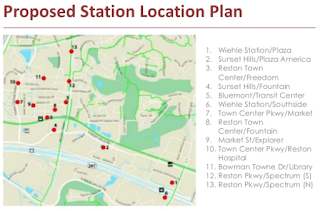 Locations of 13 bikeshare stations were identified in the study clustered around the Reston Town Center and the Wiehle-Reston East Metrorail station. More info about the meeting will be posted on the county Bicycle Program site. See info from the last bikeshare update meeting. The Turner-Fairbanks Highway Research Center is looking for bicyclists to help with a study on bicycle signals and signs. Participants in the study will be paid. The Center conducts transportation research and was in the news last year when President Obama toured the facility and sat in the driving simulator used for testing new road designs and signage. If you have a couple of hours to participate in the study, contact the Center at 202-493-3335 or email HCS.Research@dot.gov. According to the study team, "We usually offer a wide range of times throughout the day and sometimes on Saturdays as well. We should be starting the project this upcoming Wednesday October 21st and will continue it into November." The Center is located on Georgetown Pike adjacent to the CIA. It is possible to bike there via McLean to the paved shoulder on Route 123 to Chain Bridge Rd to Georgetown Pike. The public meeting to discuss paving a portion of the Cross County Trail in Wakefield Park will be held at tonight, Oct. 15, at 7 p.m. at Kings Glen Elementary School Cafeteria, 5401 Danbury Forest Drive, Springfield, VA. See the earlier FABB blog post for more info. The paved surface will be easier to maintain and provide a much better surface for most trail users. Even so, some opposition is expected. Cyclists are encouraged to attend the meeting to learn more about the project and voice your support. Yes, Tysons now has over two miles of new bike lanes that were created when several roads were repaved this summer. FABB has advocated for ensuring that as Tysons redevelops from a car-centered suburban office park to a transit-oriented community that bike access plays an important role. Join FABB in celebrating the new bike lanes by signing up for our Tysons Social Ride on Sunday, October 25, leaving at 10:30 a.m. We will gather at the Vienna Town Green located at the intersection of Route 123 (Maple Ave) and the W&OD Trail. The ride is just over 11 miles. To join the ride please register on Eventbrite. Tysons is not flat so be prepared to do some moderate climbing. We will ride at a slow pace, regrouping as needed along the way. A few stops are planned to discuss the changes happening in Tysons. After the ride you can also join us for a light lunch at The Caboose. To join the ride, register on Eventbrite by Friday, October 23. All riders will need to sign a waiver. Helmets are required. The Fairfax County School Board election will be held on Tuesday, November 3. FABB recently sent a survey to all candidates running for School Board seats. As a nonprofit organization we do not endorse candidates but we can let people know the candidates' views on various bike-related topics. Since 2005, Fairfax Advocates for Better Bicycling has been promoting Safe Routes to School's five points of Engineering, Education, Encouragement, Enforcement and Evaluation throughout Fairfax County. Bicycling is a life skill that can be enjoyed residents of all ages. It provides a low cost, healthy form of transportation and recreation. A year ago, the Board of Supervisors unanimously approved the Fairfax County Bicycle Master Plan, which includes recommendations regarding school transportation. That section begins on Page 69. So that Fairfax County bicycle supporters and all voters can be informed about your views and level of support regarding school transportation issues, we would greatly appreciate if you would complete, sign, date, and return the short survey below to Fairfax Advocates for Better Bicycling at chairman@fabb-bikes.org no later than October 23, 2015. We will compile and publish the survey results as a nonpartisan, educational tool before the November election. Please note that our 501(c)(3) status prohibits us from endorsing candidates and contributing to partisan election campaigns. 2. Do you support the hiring of a full-time SRTS Coordinator position to help achieve this goal (current position is grant funded until Aug 2016)? 4. Do you support a comprehensive transportation study of FCPS, akin to the school lunch and school start time studies, to understand FCPS' student transportation patterns, regional traffic impact, costs and other factors that drive decision making. The public meeting to discuss paving a portion of the Cross County Trail in Wakefield Park will be held at 7 p.m. on Thursday, October 15, 2015 at Kings Glen Elementary School Cafeteria, 5401 Danbury Forest Drive, Springfield, VA. See the earlier FABB blog post for more info. The paved surface will be easier to maintain and provide a much better surface for most trail users. Even so, some opposition is expected. Cyclists are encouraged to attend the meeting to learn more about the project and voice your support. Reston-resident Denise came by the Bike to Work Day pit stop at the Silver Line Wiehle-Reston East Metro station and shared that she regularly rode to work and around the town. She said biking for her was a faster means of transportation than driving to work. Denise also loves getting exercise and fresh air when she bikes. She thinks more bike lanes and better driver training would make biking in the county easier and safer. The Wiehle-Reston East Station boasts Fairfax County's first enclosed, secure bicycle parking facility. This facility provides over 200 bicycle parking spaces located adjacent to the station's bus platform and kiss and ride area and helps make bike commuting to and from Reston much easier. Building out the entire thing would make the Custis Trail one of the longest trails in the region. It'd be up there with the W&OD Trail's 45 mile long path, and it'd dwarf other well know trails in the area like the Mount Vernon Trail (18 miles) or the Capital Crescent Trail (11 miles). You'd be able to take the trail all the way from the Key Bridge to Manassas Battlefield National Park and beyond. Working new trails in with road plans is a way to make sure that even highway expansions are, in their own way, bike and walking-friendly. For such efforts to be successful, though, trails have to both get built and is adequate for people's needs. Otherwise the trail just gets seen as a simple amenity rather than a necessary part of the area's transportation infrastructure. The latest plans are online in several detailed segment drawings and an overview drawing of the proposed trail in Fairfax County. The detailed drawings indicate that most of the parallel trail ramp crossings will be grade-separated, similar to those on the Custis Trail. The latest design indicates that less right of way will be needed than was earlier thought, which should reduce concerns from residents. VDOT is holding meetings in Fairfax on Oct. 19 & 20. These meetings are a great opportunity for area cyclists to voice their support for this new trail. Just because the trail is shown on plans does not mean it will be built. Your support is critical. Fairfax Park Authority is holding a meeting on a proposal to pave a section of the Cross County Trail in Wakefield Park. The meeting is next Thursday, October 15 at 7pm at Kings Glen Elementary School Cafeteria, 5401 Danbury Forest Drive in Springfield, VA. The Cross County Trail in Wakefield Park is an important bike route between Little River Turnpike and Braddock Road. The existing trail has a rough, unpaved surface that is difficult to use and maintain. Fairfax Park Authority is proposing to pave that portion of the trail. Some local residents and others are opposing the plan. Some have criticized the paving on the grounds that it creates more impervious surface and that a natural surface trail is better. The existing compacted gravel trail is considered a semi-impervious surface. After heavy rain the trail can be damaged and become difficult to use. A paved surface would not add significantly to the impervious surface, would be much easier to maintain, and would be preferred by most trail users. Anyone who uses the W&OD Trail knows that most cyclists, runners, and walkers use the paved trail, not the parallel unpaved trail. If you cannot attend the meeting, send questions or comments to William.boston@fairfaxcounty.gov. Students in Fairfax County Public Schools (FCPS) will participate in International Walk to School Day on Wednesday, October 7, in an effort to promote physical activity and reduce traffic congestion and pollution near schools. Safe Routes to School (SRTS) programs get kids physically active and take cars off the road. The percentage of students walking and bicycling to school declined from 48 percent in1969 to 13 percent in 2009. The increased number of Kiss & Ride users has exacerbated traffic conditions around many schools and has made it more difficult for student walkers and bicyclist to get to school. Find out more about Safe Routes to School in FCPS. The Board of Supervisors election will be held on Tuesday, November 3. FABB recently sent a survey to all candidates running for Supervisor seats and to those running for Chairman. As a nonprofit organization we do not endorse candidates but we can let people know the candidates' views on various bike-related topics. REI Community Space at Wunder Garten, 150 M St NE, Washington, DC. Stop by, grab a beer or a snack, and say hello to our new Executive Director, Greg Billing. Nothing too formal, just a nice fun after-work gathering with our friends from REI. At the Burke Centre Virginia Railway Express station Bike to Work Day pit stop, Burke-resident Bryan Sweeney told FABB that he rides as part of his commute to DC and for training and enjoyment around the Clifton area. Asked what he likes most about biking, Bryan responded “Everything!” In response to another question about what he thinks would make cycling easier and safer in the county, he suggested that efforts to increase motorist awareness of bicyclists would be helpful. FABB continues to work with Fairfax County government and local law enforcement to expand public consciousness about safely sharing roads and to increase knowledge of the “rules of the road” that protect law-abiding cyclists from motorists who do not understand or choose to ignore the law. Home is where the bike is appeared in the Washington Post recently, describing how more and more renters are asking for secure bike parking when they look for a home to rent. Most apartment buildings in Fairfax County either have no bike parking or the parking that's provided is inadequate. We hope this will change in the near future as Fairfax adopts new Bicycle Parking Guidelines and county officials encourage more developers to provide safe, convenient bike parking. Some renters want to live close to a Metro station. Others look for a building with reasonably priced parking. But for a growing number of District residents, a place to park one’s bike is the most crucial component of apartment living. As the city adds bike lanes to make commuting easier, local apartment buildings have gotten on board with the trend, adding bike-friendly amenities to entice renters who cycle. Shankar Kulumani, 28, bikes to class at George Washington University, where he’s a doctoral student in mechanical and aerospace engineering. He and his wife, Christine Kulumani, 24, have three bikes between them, so they made finding a bike-friendly building a priority in their apartment hunt. A year ago, the couple moved to 2800 Woodley (2800 Woodley Road NW; 877-698-4894), which has a secure bike storage space and a bike repair station in the garage. The bike repair station includes an air pump for tires and a set of tools to fix chains and other bike parts in need of maintenance. The video-monitored storage space can accommodate around 40 bikes. Renters who want to store their bikes there get a separate key to access the caged area. 2800 Woodley, which is managed by WC Smith, added the bike amenities about two years ago in response to the popularity of the similar amenities offered at a newer WC Smith-managed property, 2M Street (2 M St. NE; 855-374-5266), says Tanya Congdon, community manager at 2800 Woodley. The effort has paid off; the bike storage space is currently full and has a waiting list, Cong­don says. Kudos to WC Smith for providing good bike parking and the bike repair station. They are setting a great example for others to follow. 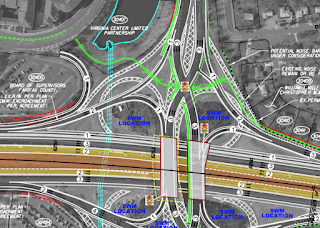 The drawings for the I-66 Outside the Beltway project are now available on the VDOT website. We are very encouraged that the parallel trail on the north side of I-66 is an integral part of the project. Many of the ramp crossings are grade-separated using either a tunnel or bridge to allow safer crossings of the high speed ramps. Kudos to VDOT for including the trail, an extension of the Custis Trail, in their plans. Also shown on the drawings are the bike facilities across the bridges that will be rebuilt as part of the project. 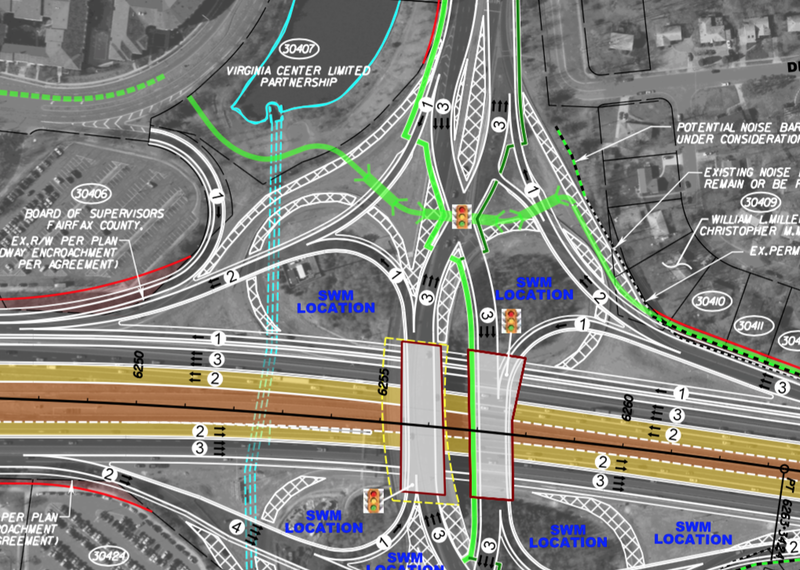 In the Nutley/I-66 drawing on the right you can see "Proposed Shared Use Paths" as solid green lines. The parallel trail is on the north side weaving through the interchange with bridges or tunnels crossing the ramps. The dashed green line in the upper left is the "Proposed Shared Use Path (By Others)," which in this case would be a section of the parallel trail built by Fairfax County. There's a great deal of information in a large number of drawings. These will be printed and placed in sequence at the public information meetings planned later this month. Cyclists are encouraged to attend these meetings and learn more about the proposed bike facilities and support VDOT's trail proposal. Even if you don't support the expansion of I-66, if the project is built, we strongly support the trail proposals.